With numerous state parks, there is no shortage of hiking trails with plenty to do and see through the Cornhusker State. Whether you want to hike along the Missouri River or stroll through tallgrass prairies, Nebraska has trails for everyone. 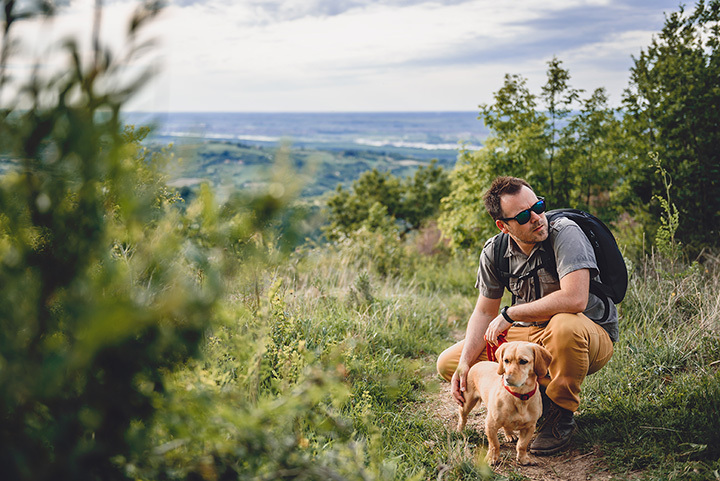 With so many popular and lesser known trails to choose from, it can be tough to narrow it down a favorite, but here are our favorite hiking trails in the state. Pioneer’s Park is home to over 600 acres and miles of trails that wind through all terrain, including forest, tallgrass prairie, and a stream. Spend a day hiking here and you will also catch sights of bison, white-tailed deer, and elk. Located only eight miles from downtown Omaha in Fontenelle Forest, this diverse 3.4-mile trail curves through beautiful lakes to an old trading post. Bring your binoculars for some amazing bird watching as well! Travel back in time to 19 million years ago on this one-mile scenic trail that winds through fossilized burrows, roots, and Miocene-era remains inside Nebraska’s Agate Fossil Bends National Monument. Another great place to hike in Scottsbluff is Saddle Rock Trail, home to crumbling caprice and sheer sandstone faces that once challenged Oregon Trail travelers. This adventurous trail involves a challenging 500-foot climb, so be sure to prepare if you’re a beginner. Mahoney State Park is one of the most popular parks in the state thanks to its fantastic hiking and biking trails. During the winter when it’s too cold for trekking around, you can still visit the park for sledding and ice skating activities. The Platte River State Park is another tranquil favorite among Nebraskans for its beautiful Stone Creek waterfalls and observation towers that offer spectacular views of the Platte River and Mahoney State Park conveniently located right across the river. The Boyer Chute National Wildlife Refuge was established to protect the wildlife and fish habitat located around the Missouri River. Keep your eyes open for the over five miles of trails and you can spot over 200 species of birds, 80 species of fish, and 70+ species of mammals that reside in the refuge. If you’re looking for unofficial, angler, or game trails, Conestoga State Recreation Area provides all of the above. The trails cover over three miles of Conestoga Lake, a popular roosting ground for all types of birds. Indian Cave State Park covers a whopping 3,052 acres along the Missouri River. Both hikers and bikers can enjoy Indian Cave State Park’s 22 miles of trails. Be prepared, hiking and biking through the park will take you up and down some rugged terrain. Another great hiking option along the picturesque Missouri River bluffs is Ponca State Park. Here you’ll find over 22 miles of challenging trails for both walking and biking. Smith Falls State Park is home to the state’s highest waterfall and possibly the region’s most diverse ecological systems. You must stay on the trails when hiking here to protect the plants, but that won’t stop you from experiencing some amazing scenery along the way. Covering just over 3,000 acres of historic land, the Scotts Bluff National Monument provides both paved and unpaved hiking trail options with views of some stunning rock formations. Beware, the trail conditions are always changing so plan ahead and check the website for a conditions report. This hiker’s paradise near Chadron is home to 6,600 acres of land filled with wildlife and at least 80 miles of marked trails. Easy-to-follow trails are perfect for hikers, bikers, and even horseback riding. The award for the most out-of-the-world hiking trail goes to Toadstool Geological Park in Northwest Nebraska. The space-like rock and geological formations are a must-see for any nature lover and a well-marked trail will guide you through the sites. This trail will take you through hidden valleys, skirt rugged buttes, and you might even see a wild turkey on the way. With 5.2 miles of trails that loop from the top to the bottom of Nebraska’s Pine Ridge, you’ll get close to nature while also getting some great exercise. View more Nebraska Hiking Trails.